Dispenses cup sizes from 8 oz. to 44 oz. A dispensing system can lose money and waste cups in more ways than one. Besides wasting cups, the wrong dispenser can limit your options, reduce productivity, and force you to install a costly new system just to change cup styles or switch sizes. The San Jamar Sentry and EZ-Fit cup dispensers offer an innovative and efficient solution. With industry-leading technology, San Jamar dispensers can handle virtually any cup size or style and dispense them smoothly, one at a time. The Sentry adjustable cup dispenser combines simple, smooth, one-size-fits-all dispensing and smart sanitizing features, so you have the flexibility to choose the right cup for your operation. This easily adjustable and precision system has no wearing parts, and you can adjust the cup size right on the counter. Our adjustable lifetime lever system prevents cup marring and provides smooth, one at a time dispensing. The attractive trim ring prevents tampering, and the innovative contamination guard helps ensure cups are debris-free. 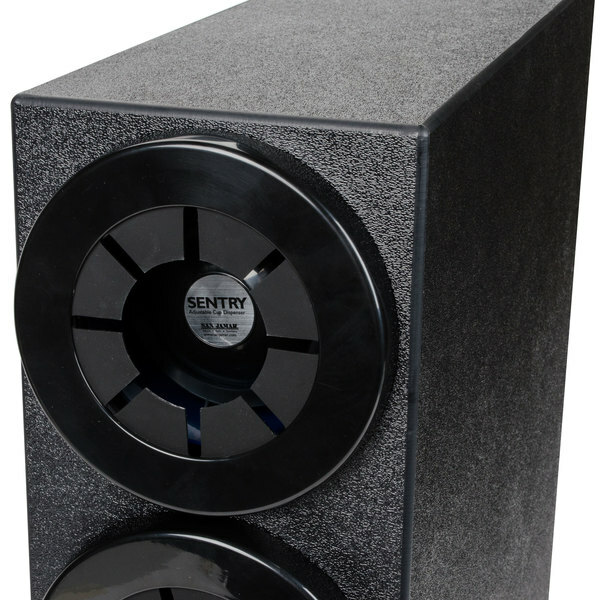 Sentry dispensers are available in a number of options, including in-counter, surface mount, or countertop cabinet systems. San Jamar's line of EZ-Fit cup dispensers provide yet another option for universal cup dispensing. The EZ-Fit system is designed specifically to accommodate a robust range of sizes and types of cups, featuring one at a time dispensing and easy cup changing. Adjusting for new cups is as simple as installing a gasket from the included gasket pack, so you can choose from a range of sizes. Metal finish trim rings offer a high-end image and polished look. EZ-Fit cup dispensers can be mounted in-counter, surface mounted, or as countertop cabinet systems. 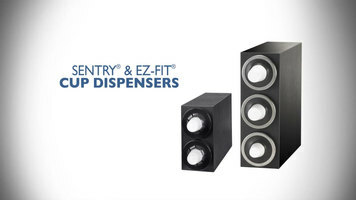 The Sentry and EZ-Fit cup dispensers are constructed from rugged, high-impact plastic. You can count on long, reliable performance in a durable design that outlasts most other industry dispensers. The San Jamar Wireworks dispensing system is a practical alternative to help maximize the use of limited counter space and still provide flexible dispensing. For an appealing family look you can add San Jamar straw dispensers to your counter dispensing system. Straw dispensers are available in double-sided and single-sided styles and are designed to prevent waste. To reduce waste, increase efficiency, and provide an attractive and versatile solution to your cup dispensing needs, choose from the Sentry adjustable cup dispenser and EZ-Fit cup dispenser families from San Jamar. For more information on this and other smart dispensing products, visit sanjamar.com. San Jamar's Sentry and E-Z Fit cup dispensers offer smooth, one at a time dispensing to help reduce waste and increase efficiency. They're also easily adjustable to accommodate different sizes when needed. Perfect for self service stations at your convenience store, coffee shop, or concession stand, this San Jamar C2953BK Sentry three tube countertop cup dispenser holds all foam, paper, or plastic cups from 8 oz. to 48 oz., with rim diameters of 3 1/8" to 4 1/2". 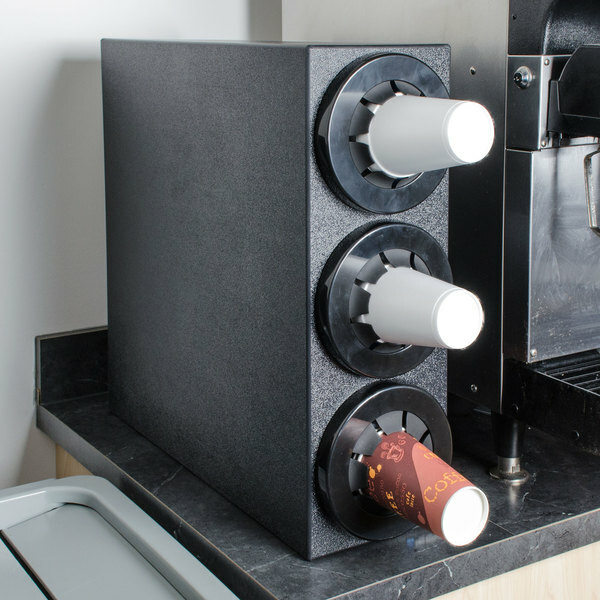 Each dispenser tube features adjustable Lifetime Lever tabs that allow for quick, easy size adjustments and prevent damage to cup edges, which can result in leaks and spills. Innovative Contamination Guard gaskets keep debris and dust from entering the tubes for sanitary and worry-free service. Thanks to its stylish black polystyrene exterior, the San Jamar C2953BK Sentry countertop cup dispenser is both durable and light weight. Cal-Mil 1013 Cup and Lid Organizer 13 1/4" x 7 1/4" x 11 3/4"
This cup dispenser takes up little space but efficiently organizes cups by size at serve service beverage stations. They hold three different size cups securely. 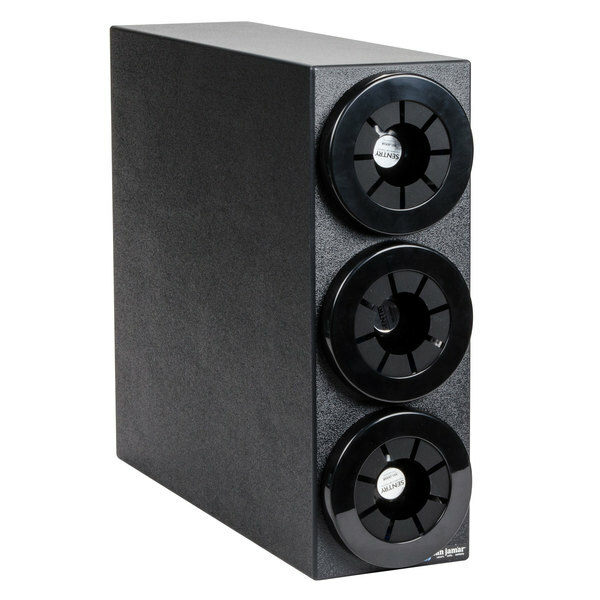 Heavy duty and very solid unit. Made of quality material. Very easy to configure for different size cups and allows for small, med, Large drinking cups. THIS PRODUCT IS GREAT FOR MULTIPLE USE.ITS WORK GREAT FOR US LOOK AND WORKS PERFECT.ITS DURABLE AND EASY TO ADJUST THE SIZE FOR THE CUPS. We were pleasantly surprised with this cup dispenser. It is very sturdy. It does not move at all when cups are pulled out. It is easy to load and cups come out with no problem. 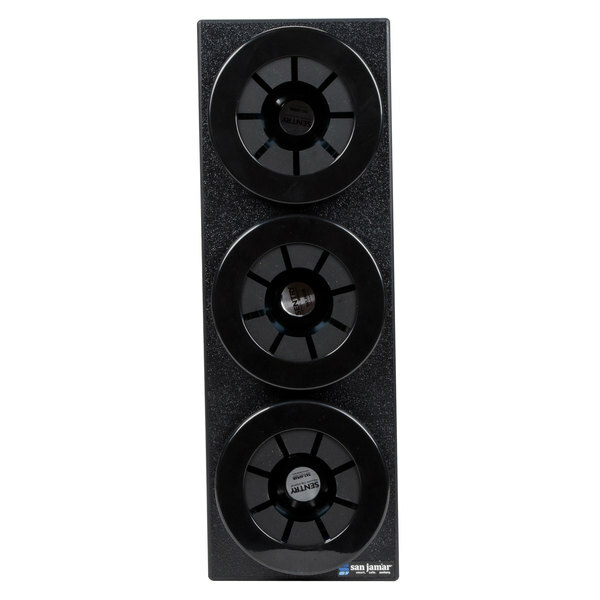 All of the required hardware comes with it to adjust for a variety of cup type and sizes.